Now I have my beautiful new camera, I just want to take photos of everything. I always used to try writing 'life' type posts but I didn't feel they were all that interesting to others as I don't really do much. It just feels like all I do is work. One of my favourite 'life' blogs is Megan over @ The Fairest. I've been following her way back when she had a Tumblr and I really admire her posts. I will still be reviewing makeup of course but I will throw in the odd post about what I've been up to. Recently my Mum's boyfriend introduce me to this lush Chinese. If there's something I love it's Chinese food. Noodles and sweet and sour veggies are my weakness. Working all day on Sunday means I don't feel like doing much on a Saturday night, especially not going out. 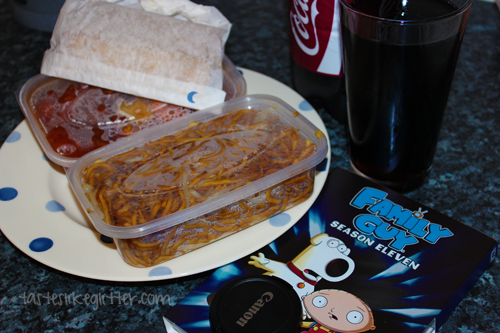 This evening I've had a night in with the dog and kitties on my own, with a takeout to myself, some Cherry Coke and back to back Family Guy. 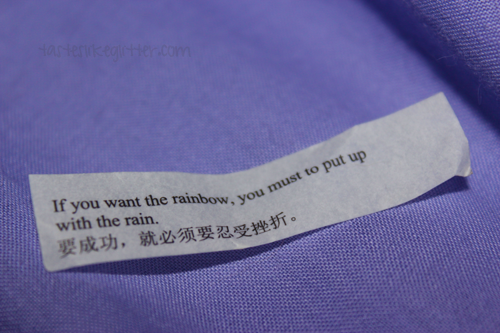 I love that this place pops fortune cookies into each order. I love quotes and these little things make me feel better. It's a nice little pick me up. 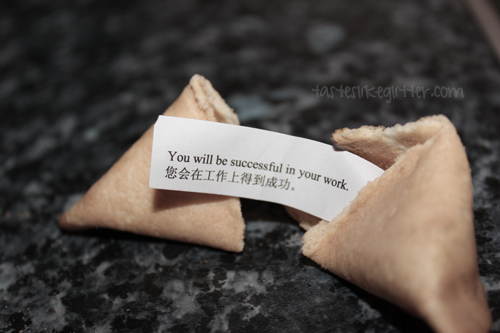 Maybe I will be successful in my work. And whilst the last one has an error (it's meant to be 'you must learn'), it's one of my favourite quotes. I worked like a mad woman this weekend and scheduled a whole ton of posts for you, look out for those. Having a new camera has made me want to fall back in love with blogging as I know my pictures are better than they were before and I think that's really important. I'm going to stop rambling and get back to watching Family Guy and continue to be squished in my bed by the animals!